Why is my machine slowing down? - Ask Leo! Why is my machine slowing down? 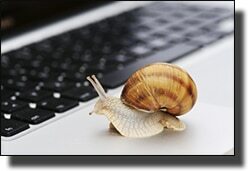 A PC running Windows can slow down for many reasons. Viruses, spyware, updated software, disk fragmentation, and more can lead to performance drops. Slow machines represent one of the largest sources of questions to Ask Leo! Perhaps when you purchased it, your computer ran like a champ and did everything you needed (and quickly). Now … well, not so much. Perhaps it takes forever to boot. Or starting applications is slower than molasses. Or maybe the machine just acts sluggish when you try to use it for just about anything. Regardless of the specifics, the underlying theme is simple: it’s slow. The problem is that there are many, many reasons that a machine could slow down. I’ll try to list a few of the most common reasons here, along with some advice on what steps to take. An assumption I’m making here is that it’s your entire machine that is slow, not just one or two applications. For example, if Internet Explorer has slowed down while the rest of your software runs just fine, then you’ll need to take a different approach than what I’ll outline here. You’ll need to focus on the specific applications that are behaving slowly. Perhaps some of the solutions may be the same, but arriving at those solutions and choosing one will depend a lot more on investigating the issue with that specific application. Nope. Here, we’re talking about a slow computer, no matter what you do. If the slowdown is sudden and severe, the very first thing that comes to mind these days is malware. Of course, your anti-malware tools are your first line of defense. Make sure that they’re up-to-date and run scans using both your anti-virus tool and anti-spyware tool (assuming you’re using two separate tools). I’d also consider a run of the free tool from malwarebytes.org. Naturally, I have recommendations for anti-malware tools . Another step that I take when my machine seems to be slowing down, particularly if it’s sudden and unexpected, is to fire up Process Explorer. Very often, one source of a system slowdown can be attributed to a single program running on your machine that is attempting to use all available processing resources. When that happens, other programs (often including Windows itself) aren’t able to respond to your actions as quickly as otherwise. How do I find out what program is using all my CPU? will walk you through the steps using Process Explorer to identify any processes that are in this state. Similarly, a program that’s using the disk heavily (i.e. the activity light isn’t even flickering, it’s just on), or even using the network heavily can manifest as a system that is or seems slow. I have constant disk activity, and I don’t know why. How can I tell what program is doing it? and How do I monitor internet activity and see who’s using it? will help you identify those culprits, if present. This isn’t as common, but it definitely does happen. We normally think of most hardware failures as sudden and catastrophic. Sometimes, they’re a little less catastrophic than we think. For example, if a sector on a hard disk is going bad, that may first manifest as a slowdown whenever that sector is accessed. The disk drive will try multiple times to read a marginally bad sector before giving up and that takes time. If multiple sectors are affected (which is common if it’s an area on the disk media that’s been damaged, for example), then this might be happening for more than one and that time could be adding up. The system keeps working because the sectors aren’t so bad that they actually fail, but they take additional time to be read because they’re going bad. Back up, of course. Impending failure can quickly become actual failure and data loss. In situations like this, I typically start by running CHKDSK /R, and/or SpinRite to diagnose and possibly repair the hard disk in question. In my experience, the number one cause of a system gradually slowing down over time is simply that it’s being asked to do more and more and it’s trying to run too much software simultaneously. Over time, people ask their computer to do more and more. Generally, folks find themselves in this situation after installing software on their machine that includes a component that always runs. Over a long period of time, there’s so much running on the machine even when it’s not in use that when it is in use, there’s not enough computer left over to run the desired programs quickly and efficiently. Examples of software that might get installed over time? Webcam software after getting a web cam, instant messaging programs, Skype, Dropbox, Evernote, screen capture utilities, TrueCrypt, and so on. There are many possibilities and that doesn’t even take into account the ubiquitous software update checkers and quick loaders that so many software manufacturers seem fond of leaving around to run all the time. Run Less Stuff: Start reviewing the list of software that’s running on your machine when you’re not doing anything (Process Explorer will help) and question everything that you’ve installed. Uninstall everything you don’t really need. Beef Up Your Computer: It’s a common adage that adding RAM to your computer is one of the quickest ways to speed it up and this is why. If RAM is a constraint for the software you’re running, then your computer will absolutely slow down. Adding RAM to your system, if it’s possible, just fixes that. It’s not the common problem that it once was (particularly with Windows 7 doing a defrag automatically now), but it’s possible that your hard disk has become fragmented. All recent versions of Windows have built-in defragmenting tools. In Windows Explorer, right-click on your hard disk drive (normally C:), select Properties, and click on the Tools tab – there you’ll find the disk defragmenter. It’s a good tool to run periodically, although how often will vary depending on your computer usage. Windows 7 will defrag your hard disk weekly, and if you’re running Windows Vista or XP, How do I schedule Disk Defragmenter to run with the Windows Task Scheduler? will let you set it up automatically as well. Windows 7’s choice of once a week seems like a reasonable approach. In a sense, this falls into the “Too Much Stuff” category, but applies even if you haven’t made a single change. It’s commonly understood that systems only tend to get bigger over time. That’s more-or-less the nature of software evolution and the expectations that we have of increasing functionality and support. While we normally associate that with major version updates (i.e. Windows Vista was larger than Windows XP), it can actually happen – slowly – at the system or application update level as well. Years worth of updates can slowly increase the resource requirements of your operating system and installed applications. Particularly if your system is already somewhat marginal, that increase can be enough to eventually impact your overall performance. Note that I’m not talking about files left behind after an update (unless, of course, your hard disk is filled to capacity), but simply the scenario where the patched version of application “A” might need ever so slightly more RAM than before. Repeat that for all the applications that you have installed and the updates your system takes, and it can add up. Once again, adding RAM can help if this is the case. Can I Be Sure My Machine Is Malware Free? - Believe it or not... you can't prove that you don't have malware. But when your computer slows down, it doesn't necessarily mean malware. Why Does My Machine Take Forever to Shut Down? - Booting your machine can take time, but sometimes so does shutting it down. Various issues contribute to a slow shutdown. How do I restore my backup to a new machine? - More than likely, you will want to keep the new operating system on your new machine. All that you need from your image backup is the data that has luckily been preserved. My machine’s full of malware; should I get a new computer? - For some reason many people's gut reaction to a malware infestation is to consider getting a new computer. That's just ... wrong. « Previous post: Can I ZIP My Pictures or MP3 Files to Save Space? Yes, but I’ve always had a problem knowing what exactly in the task manager should and what should not be running. I’m always afraid I’m going to hard shut down something that should be running. Is there a list of bare minimum tasks that should be running on XP? Unfortunately, not to my knowledge. The biggest problem, of course, is that “minimum set” will vary based on your configuration. The best advice I can give is to use the info in task manager, process explorer and from this article: http://ask-leo.com/archives/000029.html to attempt to identify what each particular executing task is, and decide based on that whether or not it’s “safe” to turn off. Oh, and I have yet to reference it in an article here, but http://ask-leo.com/r-xpservices is a good reference to what many of the Windows XP services are and whether or not you might need ’em. But its not even running like an i3 processor.Too slow and the funny thing is i cant even run GTA 4 although i kept the least graphic my system suddenly restarts when i am playing GTA. Actually the problem when explorer is eating ram and taking 99% of cpu is a windows bug, and occours when you right click files, microsoft has no solution and recommends that you left click all files in explorer before rightclicking them. Thanks for that info NIRee. I tracked down the knowledgebase article: http://ask-leo.com/d-40420a – it does actually have a couple of work-arounds. Computer keeps slowing down but not due to processor or memory being used up. Ran spyware and virus checker, defragged. Just seems to get stuck for about 5mins and then is alright again. Any help appreciated. I’d use task manager or sysinternals process explorer (http://ask-leo.com/d-31017a ) and look at what processes are running, perhaps who’s hogging the CPU, during that 5 minute period. I uninstalled Norton and things settled down a bit. Something is still not quite right, though. Any one else care to comment?? Thanks for your comments. My system slowdown problem was solved a bit by the defrag idea. However it did not last long. Whenever I try opening vlc or windows media player, it shows up occupying 99% of CPU cycles, which fluctuate between 70 and 90 and video is jittery. When not using them the system is still slow. All the memory and CPU usage shown on the process tab are within bounds, still the system is slow. Initialli I tried to uninstall SP2 which I thought resulted in this problem. I however formatted and re-installed windows XP, the problem exists. Is it due to some motherboard problem. Any help will be highy appreciated. After reading the whole thread, I can’t find any answers. My Windows 2000 Professional, 80 Gb Hardisk (with about 70 Gb free!) is fine until I connect to the Internet through my external ADSL modem. Actually, when I connect, the computer is still fine. But as soon as I do something through the Internet (e.g. start Outlook or Internet Explorer) the CPU usage shoots up to 100%, of which typically 98%-ish is being used by ‘System’. I then find that the computer doesn’t want to get off the web. Even when I physically take the modem out of the USB port it thinks that it is still in there. Finally, when I attempt to shut off or restart the computer, it typically freezes at the ‘Saving your personal settings’ message or at the stage just past that, when I have a blank, blue screen. If I don’t do any Internet related stuff, the computer works and shuts down fine. – The modem works fine on another computer in the house. – I bought a new PCI USB card but it didn’t help. – I have started the computer in safe mode and used Symantec’s virus scan but it finds nothing. Likewise when I run their virus scan through the Internet (though this takes FOREVER). – Bugger, bugger, bugger! I have been wrestling with this for two weeks. Any help would be really, really welcome. In 98, 2000 and XP, right click takes a hell of time to display menu. this is after installing norton antivirus. any patch or update available ??????? Ok, I just got a new computer and I’m loving it! One gig of RAM and it runs beautifully, except ONE problem. Whenever I try to play an audio file, it wants to freeze up EVERYTHING, I’ve tried using WMP and WinAMP, but the same thing happens with both, it will play for a bit, then the computer will lock up for around 2-3 mins with the song still playing but not being able to do ANYTHING at all. Is this a common problem? Do you have any suggestions? Video works fine I’d like to add. Sounds like a driver issue. I would check with the computer manufacturer, or the manufacturer of the sound card, for updated drivers. when i open task manager to see what’s bogging my computer down so much, i see that windows media player is using 100% of my cpu. Just a solid green line running across the top of the graph. It depends on what all those systems are doing, and how your network is configured. If one of those systems is hogging all the bandwidth, it’s quite possible for the network to appear slower to everyone else. Hey Leo, I just have a question for you. Recently I’ve played a game called ‘Tron 2.0’ and found that as soon as I hit certain parts of the game, the sound quality dropped instantly to about a 65kbps (crackles in the background) and the sound itself sounded like it was being played slowly on a recordplayer…long and drawn out. I eventually ignored it, despite multiple restarts by my computer and as I beat the game, I never thought much else of it until now. I was listening to a .flac file within winamp when the sound slowed down again, accompanied by the system restart. I have had absolutely no results in obtaining help from anyone thus far. I do have a problem with installing directx though…I have version 9.0b, but any time I try to install any version now to update it (or even downgrade to upgrade again), it always skips the install and automatically tells me that the intstallation is complete. I have a feeling the two issues are related, but I am not entirely certain. The thought is there that I may have a cooling issue, but I seriously doubt that as well. As for the game, i’ve run it at the lowest visual settings all the way up to the highest and it’s not had any effect either. I’m almost at my wits end about this. Is there anything you maybe be able to throw my way in terms of advice? I have the exact same problem as many of the other ppl have posted on your pages. Windows Media player 10 has started for some unknown reasonover the last few days using near on 100% of my CPU. It goes back to normall soon after I shut the program. I cant remove this program as it is now part of Win XP, Fed up now, I see from surfing the net for a soultion that many other peps have this problem too. Any ideas how to clear this up once and for all? I am very impressed by your answer and the time taken to answer it. It is very appreciated. You must have a lot of patience to do it every week. I am a retired accountant, and especially during tax time, I was very hard to live with. but it would be interesting to know. Take care, and thanks again. I just built a new computer and it is running great, most of the time. When I try running those larger programs or installinng certain things, it slows almost to the point of freezing. For example, media player will play music but wont slows/freezes when i try a movie. I have all the drivers for the computer installed. I know its not a memory problem because I have 1G DDR. When I use to do the same with 256k, and I have just reformatted the hard drive to it is barebones. I am stuck! Please help. For those of you who are looking to fix the problem where your CPU rages at 100% when you use any element of Windows Media Player or any other music/video program, here you go. Try to update your BIOS. I have a Dell (do not throw things at me) Inspiron 1100, and when I would run Rhapsody or WMP, the other programs would come to a grind. I never thought to update the BIOS, but when someone told me, I tried it, and Blammo! no more stuttering or frozen programs. or more. it takes 5 minutes for me to minimize a program!!! I have 500 ram!! windows media player has always been slow but never past 60 for me. -how do I update Bios? -Should lime wire be taking up 50 to 58.000 k? well you have slime wire say no more.. I on the other hand have a event viewer process hogging my cpu WHY? 1. Click Start, and then click Control Panel. 2. Click Appearance and Themes, and then click Folder Options (or double-click the Folder Options icon). 3. On the General tab, click Use Windows classic folders. It starts working normally as soon as you do it. Hi Leo, Can you help me with this? I have windoes xp sp2 up untill 13/06/06 i had 2.09 GHz CPU & 512 mb of Ram . Now i have 1.25GHz CPU & 512MB of Ram. Why can this be ? Can this be reset if so how ? That sounds like a hardware issue. You sure you’re using the same computer? 🙂 I’d be looking at the motherboard… losing ram happens from time to time, but having the CPU drop speed like that is odd. You might also check BIOS settings for both, but ultimately it could be many different things. Might be worth having a tech look at the box. I have a 3.4GHZ CPU and 2GB DDR Memory. Yet sometimes the machine appears jumpy and definately slows down. Surely with the CPU & RAM that I have this shouldn’t happen. I don’t run any excessive programs. There’s one more thing that Leo didn’t mention but I see a lot of… check your available hard drive space. A new computer will have plenty, but if it’s more than 4 years old you may be running low. A computer running Windows XP or 2000 should have, at the minimum, 750MB to 1GB free for optimal performance. To see what you have, open My Computer, right click on the hard drive labeled C:, and click Properties. Hi! i have a pretty knew hp pavillion dv8000 media center laptop, with 512 ddr and 180 hd,I know my ram is not that bad, but when i try to open MSN Messenger, the program freezes or takes a few minutes before it opens, i really need to fix this! please help! the memory configuration is listed – and sometimes controlable – there. looks like it’s not there. Me again. I would like to know that on my current CPU of 2.40GHz, would going to the bios and changing the CPU speed from 2400MHz to 3200MHz (whatever that means) have any effect on the speed of the computer and if so, by how much? In my previous comment, I realised I stated having 736MB of RAM. But I’ve installed one 512MB with the 256MB of RAM already in the computer, which adds up to 768MB. So how can I regain this ‘lost’ megabtyes since I bought the extra 512MB of RAM when I only could use 224MB from the 256MB of RAM. I recently bought another MB for my P4 2.2 (100 Mhz x 22)I have 512mb of RAM and a nvidia 6800 vid card. My computer take forever to open programs and even studders a bit when going through the start menu. I’ve run stress tests and received a low score on my HD in the RAMDOM SEEK and REWRITE functions. The HD is old, but runs at 7200RPM. My gut tells me it’s the HD. However, I haven’t seen too many complaints out there for slow HDs. Also, it does make the occasional loud “clank” sound. I guess I’m looking for more a concrete reason to replace my HD. I’m a very experienced user and know how to get a computer running fast, but right now I’m stumped. PS – I have considered my processor, but the MB I had in there was no where near as slow (presently my 1.13 AMD processor on my other computer is much faster), plus the new MB I bought had a faster FSB. Any suggestions? Hi i have become to addicted to bench marking and recently used pcmark 05 and to my dismay found i had one of the slowest scores and yet with 3dmark i was near the top. The problem seems to be with my HDD and when it does the hdd virus scan test i score virtually zero. I am worried that something is not set right and that i am losing an awful lot of performance becuase of this. I am running 2 seagate 160gb drives in a raid 0 configuration with a 4600+ cpu 2gig 800mhz ram and two 7600gt in sli. my laptop was running generally ok, but one day it was booted up with a separate caddied hard drive still attached. since then it has booted up very slowly and the hard drive is reading slower then before. is there possibly a overwritten driver on the hardware/cmos/bios? ive tried most of the general methods defrag, driver updates and rollbacks. doesnt seem to be a windows problem. i cant figure the direct cause or conclusion, any ideas? I Just Formatted My PC Just Cuz I Was Cleanin It Up And That I Was Gettin A Slow Loadup When I First Start My PC.. From The Point The Main Screen Loads And Icons And Whatnot There Is 0% CPU Useage And Very Very Little Memmory Used.. I Can Click On Things And Open The Start Menu With No Problem But Once I Start Using Somthin It Freezes For About A Min And Then A Few More Things Load And Use Maby 5% CPU.. I Have Just Formatted My PC And Have 0 Virus’s And No Programs Installed..
More Than Enough To Not Lag Like That..
hi my pc is equitmted with 4gb of ram igb per each slot!! ( 4 in totoal) but in the porpeties of my computer it says it has only 2gb so cna you tell me whtas oging on??? my cpu of my computers cpu 2.6ghz and with 256mb of ram and it way slow..i might be thinking of upgrading my pc to dul core will this increase my cpu??? ?and will it speed up my pcs overall performance!! im gonna get a dauk core 2 extrem processor! should buy one if it will hep my pcs performance if this wont help then i will foget buying it! I run IE7 and Mozilla. Mozilla takes no time to load while IE grinds away and finally loads. Why would one be so much faster than the other? Any solution in order to solve this hellish problem??? Yet again, you helped me tremendously. My INternet explorer was running terribly. I had installed the new AVG 2012. I didnt know it scanned my links and email as restrictively as it did. I took your advice, changed my settings and it was an instant fix. THANK YOU AGAIN!!! Please keep up the great work! You mentioned that Vista is bigger than XP, and of course Windows 7 is even bigger. But bigger doesn’t necessarily mean slower. I was playing around and decided to try Windows 7 on my 3 year old ASUS EEE netbook. I thought I keep it on a while just to see how it worked before reinstalling XP. Surprisingly, it performed as fast and probably a little faster than XP. And in my case as I use it daily with a projector for teaching, I love the way it handles the external video automatically and seamlessly. So an update to Windows 7 and doubling my RAM to 2GB, at least in my case, sped up my sluggish old computer. You are running out of hard drive space. By using simple maths, you only have 10% free space. You can start backing up the stuff you have on there to free up the space on your hard drive. I have found one of the biggest slow downs with older hardware is that the current releases of much of the software are redesigned to take advantage of the latest advances in hardware and operating system. This causes the computer to do additional work to support the latest “goodies” that earlier versions did not support. For example with 16gb of memory, program updates will tend to load more into memory for faster execution. With an older machine with 1 or 2 GBs, the disk swapping increases exponentially causing severe slow downs. The older XP versions were designed with limited memory storage and hence more efficient on the older machines. Windows 7 is a much better operating system than its predecessors, but still has a tendency to slow down over time. Aside from hardware changes like more RAM, a faster drive, etc., keeping your system clean of junk helps a lot. CCleaner is an excellent tool for that, and it’s free from Piriform.com as well. As for using a registry cleaner, be careful – they are not a proven method to repair damaged registries, and overaggressive “cleaning” can lead to a useless operating system. If the operating system has been on your computer for over a year with heavy use, consider backing up your data, reformatting your drive,and reinstalling a fresh copy of Windows on your system. That way you avoid the possibility of damaging your registry, plus you can avoid putting back on all the garbage you installed the previous time. Make sure that you have all your original software installation executables or disks before you begin, and that you note all necessary settings (network, etc.) too. My XP (SP3) machine slows to a crawl when I switch to a folder in explorer. A process manager show me that it is msmpeng using almost all the cpu resource – which I belive is Microsoft Security Essentials. I assume it scans all items in a folder – even when it has looked at only a few minutes earlier. There don’t appear to be any settings to control this. And yet this is one program that you can’t switch off. So I’ll just have to live with it I suppose. 1. Open msconfig .Type in run box for XP or search box for Vista & Win 7. Click start up and disable all start up items. This process can be reversed at any time later. Reboot. 2. Run ccleaner ..,get from snapfiles.com & is free. 3. Ensure at least 15% free space on hard drive. Remove all unnecessary programs. Revo unistaller is excellent for this ..free from snapfiles.com Use advance setting and maker sure everything is selected for removal. 4. Remove all browser add on’s & ‘helpers’ & tool bars . These can slow down browsing considerably. Google how to do this if not sure. Consider a fresh install of a different browser like Firefox or Opera or Chrome to compare speed differences. 5. Consider reinstall of operating system if speed does not return. Most newer computers have a back up copy of Windows in a hidden partition on hard drive. Google how to access this partition. Back up but only reinstall what you absolutely have to from a back up . Fresh install is always preferable to putting old stuff back on a fresh reinstall of Windows. Information on needed vs. unneeded services and which ones can be safely disabled. I did not see any info on what to do about a CPU that takes a long time to start up. My Dell Inspiron 6400 laptop takes about 11 minutes to startup. I did find malware with malwarebytes several months ago. But removing it did not help. I’m afraid something is still corrupted in the registry?? Someone suggested backing up the hard drive and then reformat the drive. Then reinstalling the backup… But, won’t this just reinstall the “problem”??? Your help is really appreciated!!! You’re right. If you simply restore from the backed up image, you will be exactly where you are now. You would have to back up your hard drive, install Windows and all of your programs from scratch, and then restore your data files from the backup. This may be extreme solution as an 11 minute startup is longer than normal, but if your computer is otherwise operating at a reasonable speed, you might find some programs which start up unnecessarily when you start windows. As Leo says, the problem is often due to “too much software … that always runs”, so preventing installed programs from starting with Windows can make a big difference. These programs should, as johnpro2 says, be shown on the startup tab of msconfig and can be prevented from starting with Windows there. Many utilities suites offer convenient startup managers, sometimes with advice regarding the desirability of disabling startup (you might want your antivirus to start with Windows, for example): the one I use, TuneUp, also allows rarely used programs to be deactivated as an alternative to uninstalling. As C Putman says, services can also be a problem, but need to be approached with care. I have used a program called “TUT: the Ultimate Troubleshooter” to manage services, as it has a clear interface and includes useful advice on which are needed and which can cause trouble. Really enjoyed this article as in my part of the world “Install Discs” (Genuine !) just do not exist. So all has to played with what you first get. So will try to add my twopence worth ! 1 As regard malware I believe that more than one app. must be run as none catch everything !. My own preferences would be Malwarebytes and Hitman Pro. With perhaps Superantispyware being thrown in for good measure. 2 As regards Startup items I find that CCleaner is a lot easier to use than Msconfig. Would advise disabling everything one is certain of first and then taking on some of the rest one at a time. 3 Also think that in any extreme case all caches including MFT should be flushed. A reboot is advisable. 4 Junk files should also be removed. Again CCleaner does a pretty good job of this. But of course there are plenty more. 5 Run sfc /scannow. Anyone who is not familiar should look up proper procedure re. their OS. 6 As to RAM which is very important I would advise using Crucial (Memory). Although a commercial App this will tell you better than Windows about your RAM (Slots etc.). Also give some indication as to cost. 7 As to defragging I use defraggler which I find excellent and very easy to use with one minor exception. This because I found out over time that defragging “Free Space” has more effect on speeding up a comp. than the default procedure. In Defraggler this is found under Advanced Options. Would advise using this first and then the normal defragging. 8 As Leo never tires of saying the real long term to all these probs is of course Image Backups. Just in case anyone is even more unlearned than myself remember that all Photo’s, Doc’s, Vid’s and Music etc have to be backed up separately. I have met people that believed they were the same as System Restore !. As all else is clear in the article I am going to risk putting in 9 !! 9 Registry Cleaning. As this is a very controversial topic, mostly because of the very real danger involved, I include with some trepidation, yet feel I must. Background is that as there are literally hundreds of thousands of Registry items (Or maybe many more than that ?) how can removing a few hundred here and there speed up your comp. My answer is that over the life of a comp removing a certain amount per week does add up over say a period of 5 years to be a significant amount. Further to this it is in my opinion not just the numbers that necessarily count but also the type of entry. As an example let me mention the incomplete removal of a pre-installed AV app., or something akin. These I have found to be extremely hard to remove without some Registry knowledge. I have used Registry Cleaners now for 7 years and for the last 4 have had no trouble whatsoever. Do admit that at first I did, but was always saved by Image Backups. But must also admit that despite doing this at least 2,000 time I have only noticed a define speedup on 2 occasions. But if anyone else does this be sure to backup Registry first. The Reg. cleaner in CCleaner (Which is fairly mild) does indeed have a default backup (But gotta be clicked ). Before you add more RAM, you need to make sure your OS can take on the extra memory. 32-bit OS systems can accept up to 4G RAM while 64-bit OS can take as much as 128G max…. I am experiencing gradual slowdowns and have 32-but OS and the full 4G RAM. I need to boost my OS to 64-bit, but money is the issue now.. Best way is to reboot and run a cleaner and your computer will be ok for a while until next time…. great info. THANKS A LOT!!! Maurice, personally i think the upgrade to 64bit is a waste of money, been there,done that and with 8Gigs of very expensive ram noticed NO diffrence in the speed of my machine. With the exception of MS Office my programmes are all 32bit so upgrading was a mistake. Best to make sure your present setup is running properly. Just my twopennorth. Whereas “Brewbox” may not have experienced any performance increase with a 65 bit OS, Maurice’s point is still valid. That is, if you’re running a 32 bit OS, adding RAM simply cannot help. Sorry – 2^32 = 4,294,967,296 so the absolute max is 4G. I’m not saying one should or shouldn’t adopt a 64b OS, but those who stick with 32 should not waste money or hopes on benefits from RAM beyond 4G. No mention was made of hardware interrupts. I had to disable my Nvidia card because of this; and I could not discover what other hardware it was in conflict with. Hardware interrupts will bring your system to its knees. This article has nothing to do with the link that brought me here. The link was from Watching Online Video Without The Stops and Starts. I also agree with this comment by Jim. Is it simply “Ask Leo” marketing, or is there a link error here? Hi Leo does the number of emails that you have sitting in your inbox also affect the speed of your computer? I get lots of newsletters and have not been diligent about deleting them. It shouldn’t affect it at all. The number of emails in your inbox shouldn’t have any affect on your computer’s speed. can you delete the old updates that you say slow a system down via “delete remove programs”, or is this not an option? It’s not recommended. The updates are there for a reason in most cases. Typically in Windows, for example, it’s all about security. The absolute best tip for fixing a windows machine that has slowed down with years of use is to create a new user account, copy (or move) over your personal files (photos, documents) and then use the new account. Once you are satisfied that you have got all your files over and everything is working you could delete the old user and all the files if you liked. I left behind everything that was not my personal pictures and documents, that is all the hidden files and folders etc. e.g. user/fred/AppData was left behind. There is a possible problem if you have installed applications for “This user only” but I have never ever done that. You will have to re-apply your name to applications that want it, eg Word etc. Obviously delete rubbish files and defrag too but the difference that creating a new user has made in the three or four cases that I have tried is much, much more that. I have no explanation for it but since I discovered it by accident I have done it on a few machines and all were restored to sparkling as-new performance. Perhaps Leo might have an explanation? Give it a try. Just create an account and try it without moving anything. Takes five minutes. I’m on the M20 motorway and my car refuses to go more than 25 miles per hour. I phoned BMW and they said check the engine while you’re moving but be careful not to fall off the hood. Injuries can result when falling from vehicles, even at slow speeds. Why do we accept computers that behave the way they do. Why can’t i get a computer whose functionality can be locked as it is and where it is? Basically I just use the internet so why should I want a thousand different vendors trying to put crap on my machine? This whole situation has become absurd. Computers are very complex, and believe it or not, the vast majority of problems are caused by installed programs, not Windows itself. If all you do is use the Internet, you might be a candidate for a ChromeBook. The functionality is locked to mostly browser activity. Or since you probably don’t want to buy a new machine, you might opt for a slim version of Linux. I personally like Lubuntu, a very light stripped down version of Ubuntu which I run on a very old machine. If you want a computer like that, buy a Chromebook. To a first approximation*, a Chromebook runs one and only one program … the Chrome Browser. Everything you do, you do in the browser and on the Internet. No user security decisions, Google keeps it updated, Google checks for viruses and malware, and Google controls the interface and all the stuff you do. *One can do things off-line on a Chromebook, it just takes some effort – mainly syncing webpages and Google drive with a local copy. But that is definitely a second-order use. My compaq machine got very much slow after installing any software even after just transferring some movies or pictures from my pendrive. it runs normal after reinstalling of windows XP. my RAM slot’s lock is broken in desktop. how can we solve it ? I’m helping out my neighbor who has no knowledge of computers whatsoever. Her computer is a year old (yeah I know…it’s a dinosaur by now!) Medion tower. Since yesterday it started slowing down and jittering when using her mouse. The funny thing is it all seems alright, until it comes into contact with moving things on the screen (a youtube video, the auto-hiding taskbar, when in a game). When the problems started she was using a wireless mouse. She switched to a wired mouse hoping that would fix it. It didn’t. The latter is a generic mouse with a driver from 2006 that Windows claims to be up-to-date and doesn’t need replacing. I installed AVG for her, removed 9 threats, updated her nvidia geforce driver (this resulted in two crashes after updating!) I’ve set things back to the restore point of 12 Feb. Things runs fine for 30 minutes, and then the jitters start again when we use the mouse. I’ve come to the conclusion that it HAS to be mouse related, but why? It’s fine until it comes into contact with any form of moving graphical interference as described above. Can anyone please shed some light on this one? I’m stumped here. Thanks. Hi again. Please disregard the previous post. It seems to be graphics card related, so we’ll be replacing that. A weak CMOS shouldn’t affect the speed of a computer. i would like to more applications on computer mantainance and latest hardware the way they work and if they get problems the solutions required. thanks. hy leo. i like your tips on technolgical issues so helpful. how will i turn on the the windows security center service? I spilled water on laptop there is a small gap between spacebar of keyboard it spilled just 2 drops on that and it got off ..will it be ok.please suggest something. I’d use a hair dryer with no heat to dry it and wait a few days to be extra sure. It may work but there is no way to be sure the damage hasn’t already been done. If you watch all the ads downloading off to the side of your article,you will notice the blue circle stops when they get completely downloaded with their mini-videos and such. Inability to stop ALL ads on an webpage is my biggest problem. Are you talking about the article you commented on? If so, something else is going on with your computer. There is only one advertisement on this page and nothing should be downloading to your computer. Please try another browser to see what happens. It might be that you have some sort of toolbar going on that is causing thirdparty ads to be downloaded. “all the ads … off to the side”??? I have no ads off to the side. There’s one up top, and one down below. And occasionally my own ad (a static image) in the middle. I don’t understand what you’re referring to. My browser choice had been Mozilla Firefox for years, because of its lack of clutter. The problems with my computer overall, and when I used Firefox, in particular, only dated back for two or three months. It started with a slowing down. I would click on something (whether on the Internet or not) and the response had been taking longer and longer, even up to ten seconds or longer. And I had been trying all sorts of things to diagnose what was causing it. I had run multiple virus scans, and they had indicating no problem whatsoever. I had searched on the web for diagnostics, and none of them indicated anything was amiss. I had run utilities such as disk check and the speed of my Comcast cable access. I had tested my memory and it was fine. I has read everything I could find published on the Internet about the causes and cures of the “script is not responding” error messages, and none of them provided any clue. I had tried to determine what might be using so much of my computer’s processing capacity… and was unable to identify the cause or causes of my problems. I tried disabling all add-ons and extensions, refreshing Firefox, re-downloading Firefox, restarting my computer, cussing… nothing had helped. I was seriously beginning to suspect that my hard drive was faulty, or that formatting it might provide a solutin. Then, on June 8, I decided to try using another browser, Internet Explorer (I.E.) to see if it would at least get rid of those “script not responding” messages. First I checked to make sure IE in my computer was up to date, and got a message saying it was. I went into IE and indicated it could be my default browser… and, it was at that moment that a complete turn-around occurred. Suddenly, the script messages no longer occurred. Everything in my computer suddenly worked as fast as ever (as fast as some three months or so earlier). Both when browsing and when not browsing, my computer’s operation was as fast as ever I recalled. But that is not the end of this story. Now, Mozilla Firefox was working great in my computer. No error messages popped up. No hang occurred. No BSODs happened. And, when I exited browsing mode, my computer was fast. What had happened? Beats me. But it seems pretty obvious to me that it had something to do with Internet Explorer doing something that had been gumming up all my computer’s performance, as well as causing all sorts of problems with my use of Firefox. Not being an expert in browser programming, nor in computer technology generally, I have no clue how the conflict originated, nor how it was perpetuated for days and days, while I tried every means I could think of, or read about, to try to end it. My guess is that you may know, from what I have told you here, what would have caused all the problems I was having, leading up to June 8, what would be changed by nothing more than telling I.E., so to speak, that it could be my default browser… even though I did not allow it to remain my default browser for more than at most half an hour. Whatever changed, it changed dramatically, and for the better, and lastingly. My computer, and my browsing with Firefox, now are working great. So I just wanted to share this experience with you, Leo, so that hopefully it might help one or more others of your subscribers. I couldn’t say exactly what happened to fix that problem, but other browsers often use components of Internet Explorer. My laptop (Lenovo) was working completely fine. But a few days ago, it automatically restarted and updated and since then the startup takes forever. After half an hour, when it usually starts, and I begin using it it’s as slow as a slug. Opening a folder itself is such a pain and my internet browser works very slow. Then when I open a folder and wait for it to load, one wrong click and it crashed and began to startup again, which took another hour. I tried everything but nothing works well. What should I do? thanks for the work done here bt mine is a question. I have a Lenovo thinkpad edge E520. this started after repair that when I start this pc normally it will shut down in use but when i interrupt its normal setup while starting it, wont shut down in use. any help please. I FOUND IT! It’s a stupid piece of software called Seagate Dashboard, and it automatically installs itself in your ‘puter when you plug in a Seagate external hard drive. For some reason, this POS does something cyclically, about once a second. Whatever it’s doing involves RAM, and as usual Windows — in combination with anti-virus software, which for some reason uses a dreadful lot of RAM — has all the RAM occupied, so the machine has to resort to virtual RAM and starts driving the HD. Getting the virtual RAM adjusted takes about a second — just long enough for Seagate Dashboard to hit it AGAIN. The system is constantly occupied with this cyclic RAM fiddling, which doesn’t show up as an activity (!) and prevents anything else from working right. right-click on it and hit “Stop”. Things will get a LOT better immediately! right-click on it again and change “automatic” to “manual” — or perhaps even “disable” — so it won’t bother you any more. Hi my son has a gaming pc it was around £500 it’s a little slow .my brother put a anti virus on and now we can’t get Google and you tube and now is very slow not sure what do do he has only download minecraftI and csgo. Would be grateful for any feedback thanks. Some AV programs slow a computer down. You might try defaulting to Windows Defender which is the AV program Leo recommends, and see if that works. even if you only want to perform a backup once in a while, and always on specific demand. It would be great to know which of the recommended backup programs have the lowest foot-print in what concerns services used/installed. first you need to install Ccleaner and clean your computer and install Hitmanpro and run a full scan it deletes malware, spyware and junks file from your computer. Upgrading your RAM You have to upgrade your ram for better performance. Go to startup button-> All programs,->Accessories-> System Tools-> disk-defrag. this will organize your files on your hard-drive so that they are easier for the hard-drive to access and produce faster speeds. Choose “Adjust for best performance” under Visual Effects to disable all the animations, or select “Custom” and disable the individual animations if you don’t want to see or you can select for better performance..